Functionally meaningful connections in the brain are generally made by neurons (that is ignoring the potential role of glia and other cells in direct information processing as opposed to their support of neuronal functions). 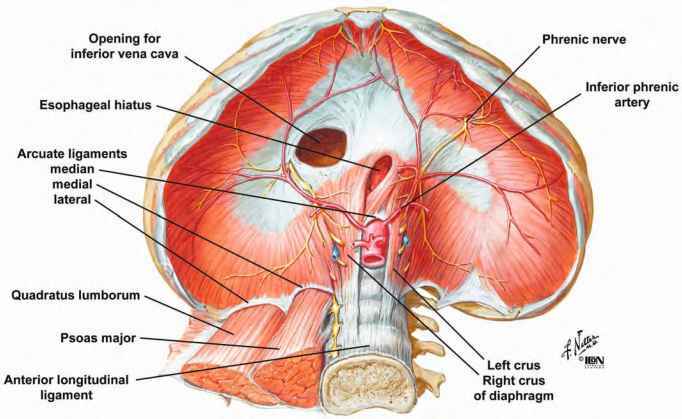 Therefore, the basic unit of a connection in the brain is the contact from one neuron to another, which is characterized by the presence of a specific structure: the neuronal synapse. Synapses have a defined morphological correlate, which can be observed by transmission electron microscopy: For chemical synapses it requires the demonstration of presynaptic vesicles, a postsynaptic density, and a synaptic cleft of about 20 nm width (see Fig. 2; Gray 1959; Jones 1975). Thus, the demonstration of anatomical connectivity at the neuronal level strictly speaking requires electron microscopic (EM) studies. At this level of detail it is currently only possible to examine small specimens in the |m to mm range, which in many nervous systems does not even comprise the entire extent of two communicating neurons. The enormous difficulty to reconstruct and label structures in serial electron micrographs explains why the nematode worm Caenorhabditis elegans with a length of about 1 mm still remains the only organism whose nervous system has been fully visualized at the EM level. Although the connectivity of its 302 neurons is largely determined (White et al. 1986), even in C. elegans the morphological details of some neuronal connections have not yet been worked up completely (www.wormbase.org). Electron microscopic reconstructions of an entire cortical column with its roughly 10,000 neurons are being considered, but have not yet been seriously attempted mainly due to the limitations of automatic reconstruction and analysis of corresponding EM structures in adjacent sections (Fiala 2002; Denk and Horstmann 2004). Fig. 2. Transmission electron microscopic image of synapses with pre- and postsynaptic components as the morphological demonstration of the apparatus for electrochemical signal transmission between nerve cells. 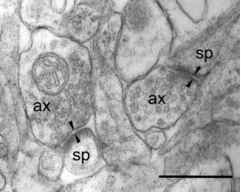 The picture shows axon terminals (ax) making Gray type I (usually cortical excitatory) synapses (arrows) on spines (sp) of medium-sized spiny neurons in the striatum. Scale bar: 0.25 |m subsequently cut out, re-sectioned and investigated in more detail under the electron microscope. While synapses and boutons are hallmarks of the connections between neurons, these do not unambiguously establish the type and somatic location of the pre- and postsynaptic neurons. The morphological neuron type is determined as a first approximation by its soma location, the somatodendritic shape, the presence of dendritic spines, the pattern of axonal termination, and the combinations of these features. Not all necessary determinants may be observed in the same preparation, which leads to incomplete morphological classifications such as 'non-pyramidal cell' or 'aspiny interneuron'. Although we now have many selective cytochemical markers allowing us to classify individual cells, this classification tells us little about the precise connectivity of this cell beyond the statistics associated with its general type. Using recent molecular approaches to classify neurons based on the expression of individual genes (see www.gensat.org) it may be possible in the future to deduce the type of connectivity of individual neurons from the presence of more specific genetic markers. The most detailed studies of structural and functional neuronal connectivity so far have been performed using intracellular recordings from nearby neurons within a cortical column or a subnucleus. Usually the cells are visually targeted under the microscope and then individually impaled with glass pipettes containing a hydrophilic diffusible marker of low molecular weight, such as biocytin. This marker spreads within minutes throughout the cytoplasm of the impaled cell and labels the spatially extended neuropil, which can be observed by fluorescence microscopy (MacDonald 1992). Neuron types in the cerebral cortex are therefore widely recognized although it remains unclear exactly how many types there are and how they would be classified best. Simultaneous targeting of several neurons has demonstrated that the probability of direct anatomical and functional connections between cells decreases rapidly with the distance between their cell bodies. Neurons that are monosy-naptically connected show similar connectivity and electrophysiological properties (Yoshimura et al. 2004). In general, however, the statistical likelihood of finding two directly connected neurons at longer distances in the cerebral cortex is zero most of the time. This statement may not seem intuitive given the calculation that on the average any two cortical neurons are connected via three consecutive synapses between them (Braitenberg and Schuz 1998). It highlights, however, the crucial role of the type of connectivity patterns in networks where each neuron makes large numbers of connections in absolute terms, but contributes only a tiny fraction relative to the total number of such connections. The role of some such patterns in cortical networks is considered in the chapter by Sporns and Tononi in this volume.